Here are my three latest projects for Phoenix Trading. This colour-in Princess Parade was a mammoth task with lots of costume and horse research required. There are six panels that all join together to make a two metre long frieze. If anyone buys the pack, I'd love to see a photo of it all coloured in. Click on the image to see more detail. Phoenix were short of cards for girls in this release so I was asked to come up with a design featuring mermaids. I only had a couple of days to produce roughs and final artwork. To save time having to have artwork scanned, I 'painted' in a watercolour style using photoshop creating lots of soft layers. The three mermaids are off to a party riding on jolly turtles. It's printed on matt paper with plenty of added glitter and sparkle. 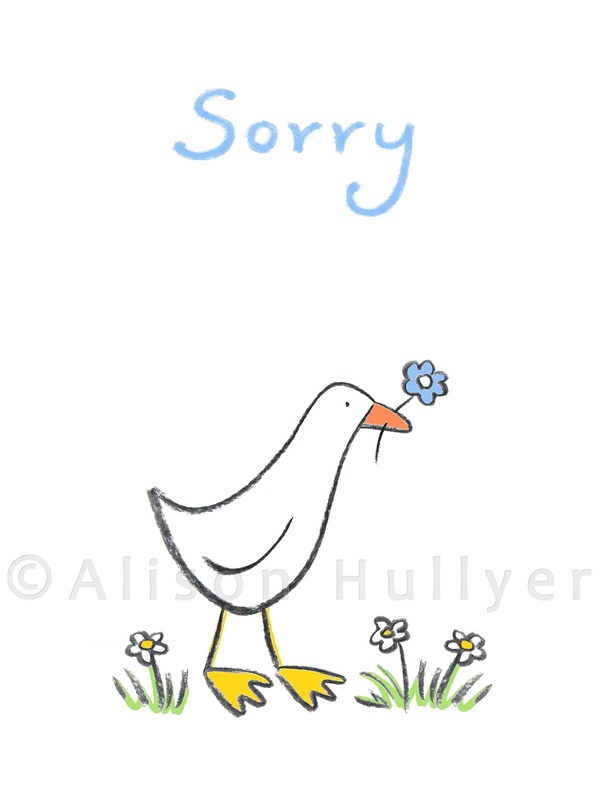 This little Sorry duck gift card is a very simple design, just charcoal, watercolour and coloured pencil. 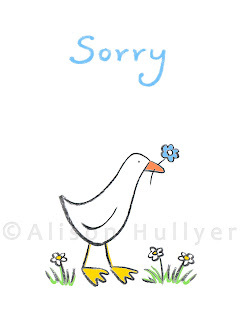 It's 83 x 110mm, the perfect size for sending a little note to cheer someone up or if you forgot a birthday or an occasion.